Prior to the mid-19th century, squirrels were thought of as fantastic woodland creatures, rather than the urbane, city-dwelling vermin they are today. In fact, the available evidence suggests that, up until this point, there really weren't a whole lot of squirrels living in cities in the United States — at least, not with the ubiquity that they now do. What changed? A couple of things, according to a paper published in The Journal of American History. First, human architects and city planners got really into the idea of urban greenspace for the first time, constructing elaborate parks like Central Park in New York. Second, the humans then imported squirrels from the countryside to add to the bucolic ambiance they were hoping these parks would foster. The rest, as they say, is all rodent breeding and natural selection. To be sure, squirrels weren’t the only animals introduced. As Benson explained to me in an email, they were part of a small group of creatures, including starlings and sparrows, that was intentionally brought to cities at the same time in the 1870s. 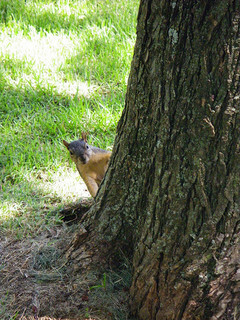 However, squirrels stood out to city dwellers for three reasons: they’re a native North American species; they’re diurnal mammals that can deal with human contact fairly well; and they oftentimes look like they are begging, a characteristic that attracted those with soft hearts and extra breadcrumbs. Following their introduction, squirrels became a cultural touchstone. “What was probably most surprising to me was in a way how surprised (and, often, delighted) urban Americans were to have them around,” Benson told me. Institutions, like Harvard University, constructed nest boxes and handed out bags of nuts in the winter time to keep the squirrels from going hungry. Meanwhile, ordinary residents also found pleasure in providing for the squirrels. Some people even became local celebrities for their efforts, like the feeders of Washington DC’s Lafayette Park, who handed out over 75 pounds of peanuts weekly.